It started on a picnic bench. "What do you mean matching?" they asked. So I dove into my rant about how I hate even the slightest bit of matching with anyone. How in high school my mom and I would come downstairs wearing similar colors--even something like jeans and a blue t-shirt--and I would go change. I went on to say that even worse than matching with a singular person was matching with a large group. For my grandparents' 50th wedding anniversary a few years ago, my entire family (I mean the whole gang: aunts, uncles, cousins) went to Estes Park, Colorado, for a family vacation. My aunt made everyone these really cute shirts that said "Short Family Vacation," and when we were supposed to all wear them together, I carried a jacket around with me just so I would have a bit of distinction. At this point a psychologist would probably ask me if I was a twin. I am not. My coworkers found this matching hatred amusing yet also odd and tried to get to the bottom of it by asking me if anything had ever happened in my childhood to scare me so terribly that I would forever hate to even not-so-closely resemble someone else. The only thing I could think of was one Easter when my mom dressed me in this green and white dress. And my sister was wearing the exact same dress. She was less than one year old, and I was holding her. In case you missed it, she was wearing the exact same dress. I was eleven, and she was not even 1. Two weeks went by, and it was my last day at work. My friends threw me a lovely going-away party, and at the end of it Hillary stood up and said there was one more thing. "This is," said she, "probably the thing I am the most proud about of all the things I've accomplished here at T---." My eyebrows raised in a classic puzzled frown as she continued. "Do you remember when we had that conversation about matching?" "Umm, yeah. I think so," I said. "Well, for the last two weeks Hannah and Ashley have been spies. They've been getting to work early to check out what you're wearing, and then they send out a mass text to everyone in the office." At this, everyone burst out laughing. "And the best part," she said between laughs, "is that for the past two weeks at least one person in the office has matched you every day." Of course I didn't believe her, because hello I'm not stupid. I would have noticed something like this going on. But then I remembered that I am actually the most gullible, oblivious person ever and therefore would definitely not have noticed something like that going on. The awesome part is that they have pictures to prove it. Hillary said they didn't take pictures every day, but when they did... oh, hello, STALKERS. My favorite is the picture on the right, where Lindsey is looking directly at the camera and smiling. And I'm like, "Yum, this Subway sandwich is so good. Nom nom nom." I really don't even know what to say. To be honest, it's a bit embarrassing. I can't decide if it's more embarrassing that we're in Subway again or the fact that I'm wearing brown... again. Or the fact that (so I hear) this particular day I complimented Hillary's yellow shoes. The yellow shoes she was wearing because of me. Come on now. I'm confused why I hate matching so much when I clearly don't even realize that it's happening. This next one is pretty bad. I remember saying, "Are you taking a picture of us?" But they gave me some lame excuse and I bought it, never noticing that Hillary and Liz were flanking me, both wearing a brown dress and white undershirt. Yes, brown again. I have no words. On the very last day, I unknowingly wore something easy: black and white. And 12 people wore black and white. Because they're the freaking best coworkers ever. On that day, Ashley really did stalk me. She got up early to drive over to my apartment and wait outside until I came out. She said she wore jogging clothes and a hat to either disguise herself or, if I saw her, explain why she was there. There was also a confusing fake hospital trip that she had considered, but that could have only ended badly. Hillary gets the gold star for either being creepy or a really good dresser, depending on how you look at it. She was the only one who matched me every single day, no matter how crazy it got. At one point she said, "Does that even match?" and wore it anyway. I was told later that every single day this went on, I complimented someone on a color choice or outfit selection based on something they were doing to copy me! From this I learn that 1) I'm super self-involved and 2) I really do like my own outfits. This is, in my opinion, a brilliant office prank that will probably never be matched again. Literally, if I can help it. In case you didn't know, I hate matching. Every time this comes up, I can't stop smiling. I kind of wish I had waited it out for this UPE (ultimate prank ever—I just made that up), which is a testament to how much I like you/like seeing you get Reesed. I think this counts as a variation of getting Reesed, btw. Also, I like to think that I was proactively joining in on the prank because on my last day, I wore a gray top and black pants. Yeah, crazy. But I am still impressed with the coworkers. Way to go, T employees. Props for finding ways to have fun at the crappiest job ever. And Reese, I'm sorry, but really? Two full weeks and you never noticed even one time? Never thought, "hey, you look cute! hey, we kinda match today!" That's mildly ridiculous on your part. But makes it all the more awesome for them. It's doubly awesome that they got photo documentation as well. Great prank. 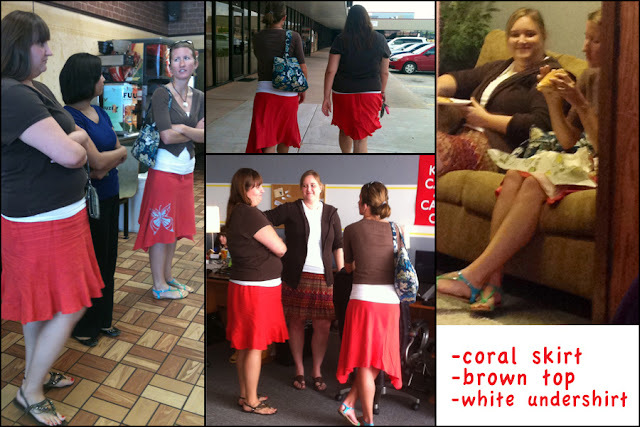 Yes, I AM that stupid :) Although I did notice on the coral skirt day, but I bought a lame excuse and thought no more of it. I did NOT, however, notice any of these photos being taken. I am ashamed. And the reason I added a list of what I wore to the pictures was not to make you feel stupid (sorry about that) but because I had extra space and wanted to fill it up. Great prank. Also, a little creepy. I hadn't read this post until you linked to it in your obsessions post and OMG I love it. Best coworkers ever. I had never seen this post before! THIS IS HILARIOUS. I can't even handle it. The fact that you even COMMENTED ON HER YELLOW SHOES. Oh man. This is golden. Haha! This is really funny. Your co-workers were so clever to pull this off! Oh my goodness, this whole post is absolutely hilarious! Best Prank EVER! What a great prank! The fact that you didn't catch on makes it a bit better. Props to your coworkers!